Fun to Learn Friends (formerly Preschool Friends) will challenge and entertain children with stories, games, puzzles, and other fun activities. Designed for children between the ages of three and eight, Fun to Learn Friends features children’s favorite characters that help to make learning exciting and engaging. This magazine also seeks to develop children’s’ skills in math, reading comprehension, and creativity. 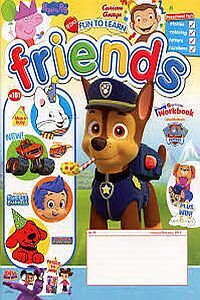 Regular features of Fun to Learn Friends includes a workbook to help encourage learning skills, as well as funny stories featuring characters from their favorite shows. Readers are encouraged to submit photos for a chance to win prizes in the “Friendlings Pen Pals” section, and the magazine also features other fun giveaways. The most popular feature of Fun to Learn Friends is the abundance of games, puzzles, and crafts. Young readers will love the hands-on activities that will inspire their creativity, and the crafts, recipes, and DIY projects are perfect for both younger and older readers. Word puzzles, alphabet and rhyming games, and bingo are only a few of the entertaining activities featured in Fun to Learn Friends. Each game is designed to help learning with a variety of themes, and also includes well-known children’s television characters. The learn-and-play nature of this magazine makes it perfect for children, and it also makes a fantastic gift! Anyone interested in developing their child or grandchild’s skills in creativity, math, and reading would enjoy a subscription to Fun to Learn Friends!